Thus far in 2018, one baby has been born alive in Florida during an abortion attempt. In 2017, there were 11 abortion survivors. There were none recorded born alive in 2016 or 2013, but there were four abortion survivors in 2015. A previous Live Action News report noted that in 2015 alone, there were several reports of abortion survivors: one in Michigan, five in Minnesota, and, as already mentioned, four in Florida — three in Alachua County and one in Jackson County. That same year, 5,132 elective abortions were reportedly committed on women between the 13th and 24th week of pregnancy; that number has since been updated to 5,195 with a total of 5,695 for all reasons, including various “health” reasons. Now, only a few years later, that number has increased substantially, especially in Alachua County. 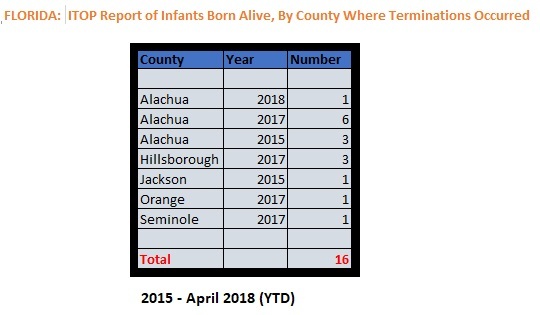 Although the documents do not indicate whether the reports of abortion survivors originated from a hospital or an abortion facility, records currently on file with the state reveal that there are only two licensed abortion facilities in Alachua County where ten babies have been reported to have survived abortion attempts since 2015. One is an abortion facility called Bread and Roses, and the other is the All Women’s Health Center, a chain which operates multiple abortion facilities in the state — including the only licensed abortion facility in Seminole County, where one baby was reported to have survived an abortion in 2017. State records also show that there are six licensed abortion facilities in Hillsborough County, where three babies survived abortion attempts in 2017. Of those six facilities, two are Planned Parenthood centers. In Jackson County, where one baby survived an abortion in 2015, there are currently no licensed abortion facilities. In Orange County, where another baby survived an abortion attempt in 2017, there are currently three licensed abortion facilities (down from five in 2016 and six in 2017) including two Planned Parenthood facilities and a late-term facility operated by the infamous James Scott Pendergraft. Was/were the infant(s) born alive during or immediately after attempted abortion? – Select the appropriate response. “Born alive” is defined in 390.011(4), F.S. as: “Born alive” means the complete expulsion or extraction from the mother of a human infant, at any stage of development, who, after such expulsion or extraction, breathes or has a beating heart, or definite and voluntary movement of muscles, regardless of whether the umbilical cord has been cut and regardless of whether the expulsion or extraction occurs as a result of natural or induced labor, caesarean section, induced abortion, or other method. What happened to the babies who survived the attempted abortions is unclear, as no additional information was available from the reports. Florida law requires that “[a]n infant born alive during or immediately after an attempted abortion must be immediately transported and admitted to a hospital pursuant to s. 390.012(3)(c) or rules adopted thereunder.” The law also requires that any employee of a hospital, physician’s office, or an abortion clinic who is aware of a violation of the born-alive law must report it. In 2013, as Live Action News has previously reported, during hearings in Florida about protecting abortion survivors, lobbyist Alisa LaPolt Snow (representing the Florida Alliance of Planned Parenthood Affiliates), admitted to the Florida legislature that Planned Parenthood takes issue with allowing infants born alive after failed abortions to be transported to a hospital. In the video, the Planned Parenthood spokesperson states that the organization believes the decision about whether to assist a baby who survives and abortion should be left up to the woman and her abortion provider. The shocking dialogue shows the depraved mentality behind abortion – that even if the baby escapes the horrific procedure alive and is struggling to survive on the table, abortion providers still want the power to terminate that child’s life. To date, the state has only reported one third trimester abortion since 2015. Reports detailing health inspections at Florida abortion facilities for 2016 reveal that deficient practices were identified in 23 of the 68 inspections conducted by health officials that year, and 15 out of 55 in 2017. Inspectors found expired medications, missing documents, discrepancies in medical records, inadequate equipment, and one including missing documentation on gestational age, among other infractions. In addition, in 2016, state fines were issued in 20 instances where abortion facilities filed late ITOP reports. The following year, in 2017, fines were assessed in 10 instances for facilities which filed late reports. Infants born alive inside abortion facilities have haunted the abortion industry for many years, as Live Action News has documented several times. In fact, one national news outlet even dubbed the term the “dreaded complication.” In 2013, Live Action’s undercover cameras exposed the chilling admissions of abortionists inside America’s late-term abortion industry during third trimester abortions and partial-birth abortions. Although these abortionists confess to the humanity of often viable, fully developed children, they inflict inhuman and cruel abortion procedures against them. This kind of delusional dehumanization of preborn children is the very reason why abortion is so prevalent today.